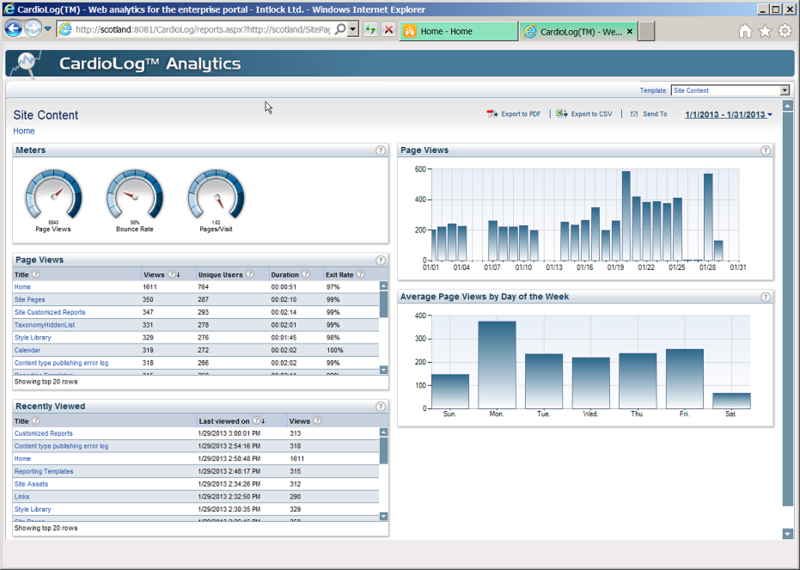 Gain a fresh insight into your website with a wide range of usage reports and dashboards. In theReportCenter, you can easily create dynamic reports that feature charts and tables, either by making use of one of SharePoint Marketing Suite’s existing templates or by building a report from scratch. You can schedule a report to run automatically every day, week or month, and you can preset permission to view and/or edit a certain report or dashboard to ensure that the right person has access to the right data. It’s also possible to send a report to a predetermined distribution list, and to share it by exporting it to various formats, including SharePoint web parts. Schedule the report: either according to a pre-defined time interval (day, week or month) or ad-hoc. Then click OK. Upon setting the report, you can create a static version with real time data (by selecting Generate Report) or you can wait until the report is automatically generated – according to the report scheduling. As long as there are no static versions for the report, when selected from the Reports tree - it will be displayed in Edit Mode (if there are edit permissions for the current user). Otherwise, the latest static version will be displayed. Edit – change the report mode to Edit Mode - for editing. To edit the time frame for a static report, click the Date Range link on the top right of the report. Then select the desired date range and time interval and click OK.
To remove the report, including all previous versions, on the Navigation pane – right click the report and select Remove. To remove only the previous versions of the report, select Remove Historical Data. The report’s Historical Data refers to all versions from prior dates which are saved in the system. If there exists a report version for a selected date range, the actual saved version is displayed, and no query is submitted to the database. This is in order to save system resources and shorten the waiting time for the report. To modify the report properties (report title, description, number of columns and scheduling type), on the Navigation pane – click the report and select Properties. 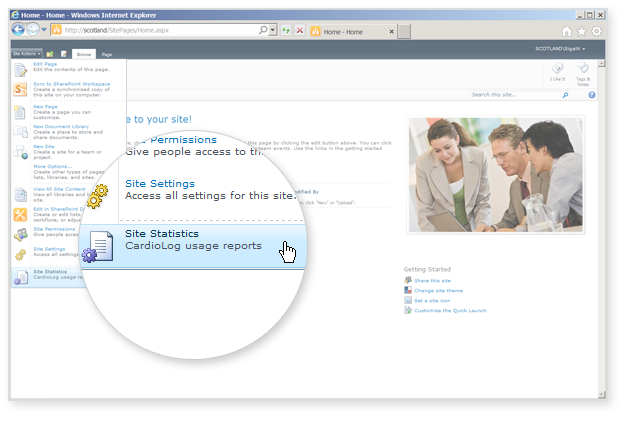 To view the report in a new window (without the SharePoint Marketing Suite scheme) on the Navigation pane – click the report and select Browse. Number of Results (Rows) per Query - Display only the top 100 rows in tables. You will be able to view all of the results when exporting to Excel. Number of Scheduled Reports - Delete unused scheduled reports. Use the Analysis Center for real time queries or to create an Ad-Hoc report and generate it manually on demand. In the Object Explorer dialog, add the portal item for the copied report. Then click OK.
On the Navigation pane, under Report Center, click a folder in the Reports tree and select New Report (You can first create a Reports folder by selecting New Folder). In the New Report dialog, select the New report from template option, and then click Next. Continue with the standard report creation steps. For more information see "How to create a template". Permissions are available in SharePoint Marketing Suite installations that include integration with Active Directory. You can set view, edit (Edit Mode), modify (modify report properties) and delete permissions for a specific report for any user or group in Active Directory. By default, the report creator has all full control permissions, while view permissions are given to everyone. In addition, you can add new users and groups, delete users and groups, or modify existing permissions. In the Permissions dialog, click Add and then enter the user/group name and the desired permissions. You can assign View, Edit, Remove and Modify permissions. User permissions precede group permissions. To assign permissions for all users, use the default “All” group. Select the desired results and click OK. In the popup message select create a Web Part with a SharePoint Marketing Suite frame style (scheme). Whenever a new report version is created, you can send an automated Email to a pre-defined distribution list. The Email includes a link to the new report version. The report link is unique and the data in the report is automatically refreshed. Whenever you browse to the report link you will see the latest generated report (based on the report type). Enter an Email address in the text box and click the Add button to add the address to the distribution list. Click Ctrl+K to select from a list. Then click Save. The system administrator creates published report templates. These templates are available from the portal pages.